Carnation is a brand of food products. 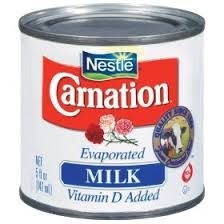 The brand was especially known for its evaporated milk product created in 1899, then called Carnation Sterilized Cream and later called Carnation Evaporated Milk. The brand has since been used for other related products including milk-flavouring mixes, flavoured beverages, flavour syrups, hot cocoa mixes, instant breakfasts, corn flakes, ice cream novelties, and dog food. Nestlé acquired the Carnation Company in 1985.